The Venerable Wilhelmina Smallman retired as Archdeacon of Southend in the Diocese of Chelmsford December 2016. 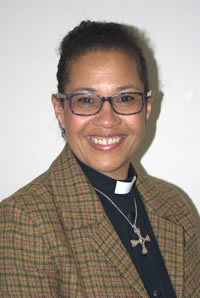 After studying a Contextual Theology degree for four years at NTMC, now known as St Mellitus, Mina was ordained in the Church of England at St Paul’s Cathedral in the summer of 2006. Before being ordained Mina studied at the Central School of Speech and Drama between 1984-1988 where she obtained a B.Ed. Hons degree in Drama, English and Voice. This led her to teach for nearly 20 years, her final teaching role was that of Assistant Principal at John Kelly Girls Technical College. Mina has faced many challenges in her lifetime however it has only made her even more determined to support the disadvantaged and to help encourage others to reach their full potential. She was the UK’s first female Archdeacon in the Church of England from a minority ethnic background. Mina believes that without the encouragement of mentors in her life, she may not have fulfilled all her true potential.